Relationship Maps show the overall view. They show the departments of an organization and how they interact with suppliers and customers. The Diary Sweet is a company without departments so the central box above has no sub-groups. To download and modify this relationship diagram, see the Drawing Instructions below. 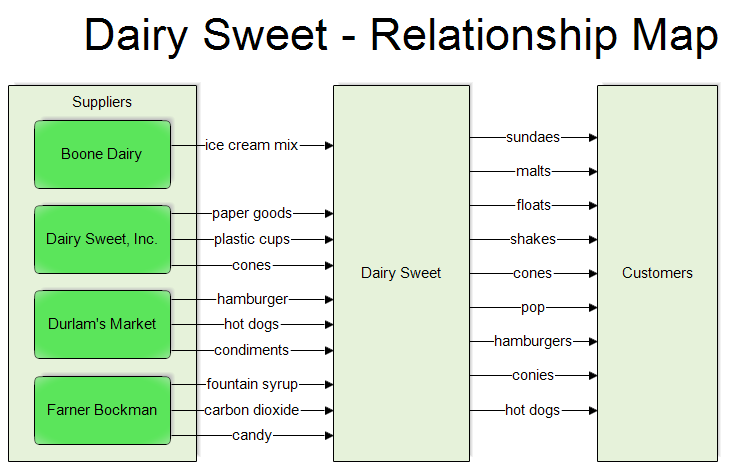 The group in the relationship map shown above is the Diary Sweet, a small soda fountain. There are no sub-groups as a soda fountain has no purchasing or marketing departments. The suppliers are shown on the left with arrows showing what they supply. The outputs of the Dairy Sweet are shown on the right. For example, the ice cream mix comes from Boone Dairy. It is added to a machine that makes the ice cream. A worker then takes a cone that comes from Dairy Sweet Inc, fills it with ice cream and gives it to a customer. To draw a relationship map, you need to know who your suppliers are and what they supply. You need to know who your customers are and what you supply them. What to look for in a Relationship Map. Are all inputs and outputs between groups shown? What is required for each input or output. Is it a paper document, e-mail, or physical part? What are the external interfaces? These are the most important to your company. Drawing Instructions If you haven't already done so, first download the free trial version of RFFlow. It will allow you to open any chart and make modifications. It is often easier to modify a chart that has already been drawn rather than draw one from scratch. Once RFFlow is installed, you can open the above chart in RFFlow by clicking on relationship-mapping.flo. To edit the text of a box or line, you can either double-click it or right-click and choose "Edit Text" from the menu that appears. To move boxes and lines, you just drag them. To size boxes and lines, you click on them and drag the handles. To change colors and other properties, right-click on the box and select Properties in the menu. To duplicate a box, right-click on it and choose Duplicate. To delete a box, right-click on it and choose Delete.